Soak the oats in cold water for at least half an hour, then drain and rinse them well. Place them in the jar of a blender, and blend for 30 seconds. Pour the oats into a nut bag and strain. Measure out 1 1/2 cups of the milk, then stir in the maple syrup, salt, and vanilla extract. 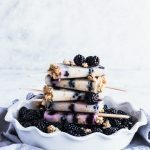 Place a layer of blackberries in the bottom of your popsicle molds (you may have to cut larger ones in half), then sprinkle in about a half tablespoon of granola. Repeat the layers until all of the molds are nearly full. Pour the oat milk mixture over the top until they’re full, then insert a stick into each one. Place in the freezer for at least 8 hours, or until frozen through. Then, remove them from the molds and enjoy immediately. Make sure that your granola meets all of the dietary restrictions you’re adhering to. Many have nuts, gluten, or butter, which would make them no longer allergen friendly.